2016 Conference: Equity and Equality of the Sexes in Communication: Are Women Getting There? Five SJMC undergraduate students have been named Research Assistants with the Lillian Lodge Kopenhaver Center for the Advancement of Women in Communication at Florida International University’s School of Journalism and Mass Communication. Students began in October working on research to identify common themes and trends discussed by the center’s monthly guest speakers from across the country. These talks of some of the top women in communication, including those in advertising, public relations, and journalism, are archived on the Center’s Leadership Webinar Series Page. Students are working alongside Dr. Lillian Lodge Kopenhaver and Dr. Robert Gutsche, Jr., to analyze themes collected from the recordings and to present them in an industry report to be released in Spring 2016. The findings will help women and men in leadership roles throughout fields of communication to encourage and support continued innovation through increased diversity. Six students from FIU and three from Whitworth University in Spokane, Washington, worked together with Dr. Robert Gutsche, Jr. in Spring 2016 to develop a digital whitepaper about inequalities among the sexes in communications fields. The report, released at an April 21 conference on women in communication, focuses on systemic issues facing women in these fields and provides solutions culled from 13 videos produced by the Lillian Lodge Kopenhaver Center for the Advancement of Women in Communication, which sponsored the report. Whitworth students, led by Dr. Erica Salkin, designed the report to make it approachable for academics and practitioners. 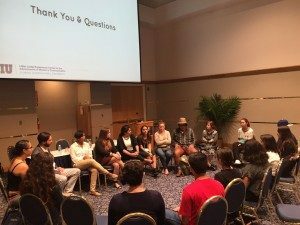 Students at FIU presented initial findings from the report at an undergraduate research conference in March. The students’ work will also be presented during a special session at the 2016 Association for Education in Journalism and Mass Communication in August. 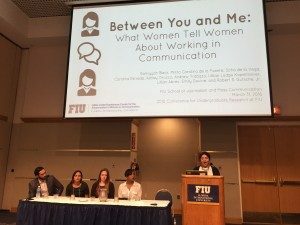 Students involved in producing the LLK Center whitepaper, “What Women Tell Women About Working in Communication,” to be released in a digital format on April 21, spoke at the 2016 Undergraduate Research Conference for Undergraduate Research at FIU on March 31. Beyond presenting their key findings the study of 13 webinars presented through the LLK Center since its inception, the group led a powerful discussion with the audience. Our student research team has started the New Year with a bang! With our data for our white paper, titled “What women tell women about working in communication,” collected from lectures given at the Center since its inception, students are placing the comments into themes. With the data transcribed, we are now working to put the whitepaper together, and have some interesting developments coming about how the report will be interactive and full of multimedia components – all student-driven and designed.